[Jesus said,] "I have told you these things so that you will be filled with my joy. Yes, your joy will overflow! This is my commandment: Love each other in the same way I have loved you. There is no greater love than to lay down one's life for one's friends. You are my friends if you do what I command." What a wonderful blessing it is to be loved! We know God loves us with an everlasting love. He has called us into a family of love. He blesses us each out of his love for us. But Jesus, of course, is God's greatest example of love. 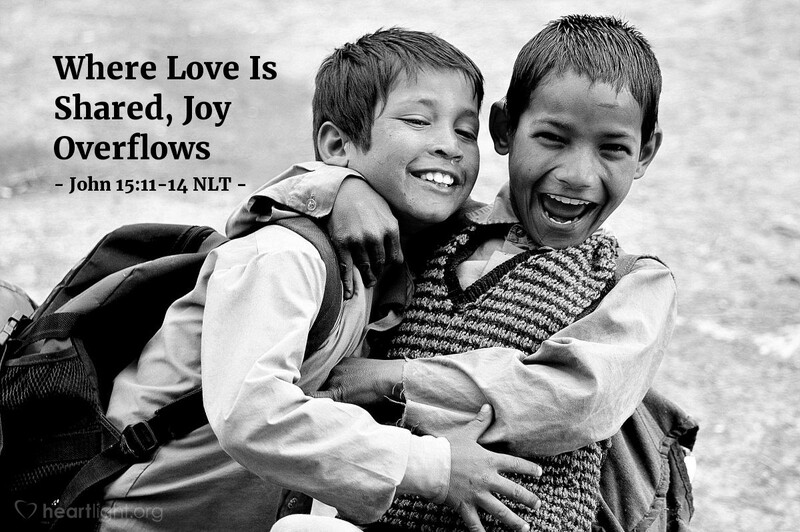 When this love fills your heart and rescues you from sin and death, there must be joy! Almighty and loving Father, God of all peoples, help me as I learn to be a more sacrificial and loving blessing to others. Keep my heart pure and my faith passionate. In Jesus' name, I pray. Amen.